This technology uses low pressure 0.3 – 10 kg/cm2 by normal temperature. The moulds are not heated so that they can be made of low cost materials (GRP, metal sheets, laminated chipboard). Moulds consist of two parts, the product is smooth on both sides. The pressure comes by the easiest way from hand clampers or using hydraulic cylinders in metal frame or in platten press. Reinforcements: Mostly fabrics based on glass or other fibres of various weight, weaving style and fibre orientation. Resins: Polyester or epoxy resins curing by normal temperature. The technology is suitable as low investment cost production with series 100-5000 pcs. If it is necessary to increase the reinforcement volume and to drain of resin excess to improve mechanical properties or to build in rigid sandwich materials – foam or honeycomb, there is recommendable to use vacuum pressure. Using the soft sandwich materials which need complete impregnation with resin it is also possible to use vacuum, but it is necessary to choose considerably lower vacuum level. Impregnated material is applied to the mould by the same way as by HLU. Peel ply (tear-off) synthetic fabric is laid as a last on the structural layers what makes easier the subsequent operations. It is possible to tear it off easily from the cured composite any time and to continue with following steps (laminating, gluing, painting) on the fresh surface without degreasing or grinding. Next layer is perforated release film followed with bleeder (breather) fabric or mat what absorbs excess resin and enables bleeding of air bubbles by vacuum force. In the end the elastic foil or flexible bag is applied which is glued by sealing putty or tape around the mould circumference to ensure vacuum function. Evacuation and pressure are of the low level (cca 0.3-0.9 bar), the moulds can be relatively simple and low cost as it is by hand lay-up. Curing is mostly carried out by normal temperature , if prepreg are used there is necessary to place whole mould assembly into heated tunnel or chamber to reach the recommended temperature. Reinforcement: Fabrics and tapes based on glass, carbon or synthetic fibres, their combination or so called hybrid reinforcement (mixture of different fibre types) of various weight. (by -18°C until 12 months). Vacuum bag technology is used for small to medium size series, the technology does not need high cost except cost for vacuum pump. Both-side smooth products incl. sandwich structures with high reinforcement volume and good mechanical properties can be obtained. Moulding in autoclave is most sophisticated and most expensive technology for series production of large-sized structures. Prepregs cured by elevated temperatures are used as a starting material. 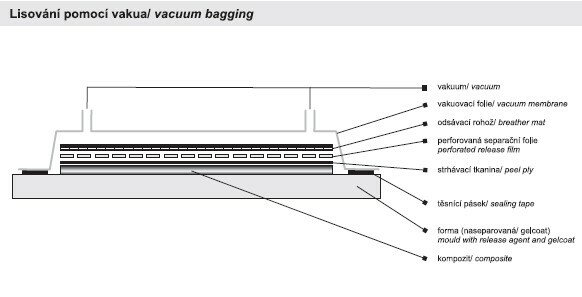 Structure of layers is practically the same as by vacuum bag technology. The mould covered with flexible foil or bag is placed into the heated autoclave. First step after moulding temperature is reached is evacuation by vacuum cca. 0.8 bar, then follows the application of pressure approx. 6 bars. Reinforcement volume can be obtained up to 60%. Reinforcements:Prepregs based on glass, carbon or aramid fibres ( for air and space applications boron or siliciumcarbide fibres are also used) mostly with epoxy matrix cured at 120-200°C. Autoclave moulding is used for most demanding large-size parts for air and space applications, racing cars and cladding panels of transport means manufactured in medium to big series. Processing is based on curing in match metal dies by elevated pressure and temperature. The moulds should have highly polished or better hard chromium plated surfaces. Moulds are mostly electrically heated and they are fixed in hydraulic presses able to reach 10-300 kg/cm2 press force. Base materials are: prepregs – SMC (sheet moulding compounds) or DMC (dough moulding compounds) or premixes – BMC (bulk moulding compounds). Prepregs of SMC type are mixtures of chopped glass fibres, resins (mostly polyester or vinylester) partly cured into so called stage B, pigments, fillers and various additives for better flow, surface smoothness and influencing some properties, for instance fire retardation or shrinkage. SMC pieces placed into mould are able to flow under the pressure and elevated temperature and fill up totally all mould cavity and subsequently to cure completely. Prepregs(SMC) in sheet form covered from both sides with polyethylene foil delivered in rolls. Polyester and vinylester resins of various types are used as matrix. Terephtalic resins are used for special types of DMC or BCM. Hot press moulding is one of most productive manufacturing method for large-scale series (2000 – 10000 pcs) of small to medium size parts. Short production cycle ranking in minutes, high quality and dimensions reproducibility and the possibility of automation of the process are advantages of this technology. High investment costs for hydraulic presses and mould manufacturing are disadvantages of this processing method.